If you need a refresher, then find out here why we ran away to Scotland. I was thinking of submitting our story to a wedding blog like Green Wedding Shoes or Style me Pretty because I love the photos so much, but the whole point was to not be judged by other people.... so I'll share it with you, my three valued readers, instead. 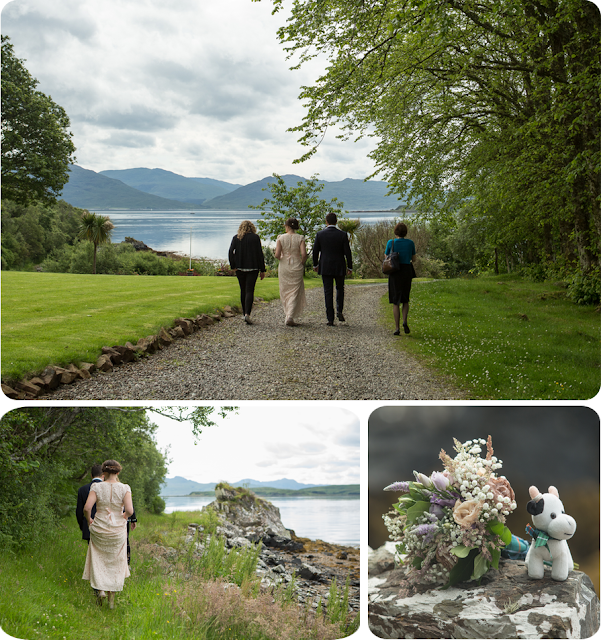 We had the fabulous hotel, we had a rock on a windswept beach*, we had an awesome photographer and the registrar, we had clear weather. And we had each other. Ahhhh. *Beach may not have been windswept. I got my dress from Review, because that's where I get all of my clothes. Appropriately, it's called the Love is in the Air dress. I bought it, ahem, some time ago and had it sitting in the bottom of the wardrobe, waiting for a rainy day... In between buying it and using it, I lost about 10 kg (not because of wedding, because...health, or lack of), and so I had to get it altered fairly dramatically by a lady ina hole-in-the-wall called Judy. I love Judy. I also love my dress. I'm going to wear it to my birthday party this year as well. Or..maybe not. I made the bunting myself, which involved a cutting board, a ruler, some spray adhesive, and a lot of googling to find a good image of Macdonald tartan. Those little flags and letters took a long time to cut out. I think I should buy myself a die cutting machine. I could have so much fun with a die cutting machine. I don't like my hair when a hairdresser does it, it's always too fussy or completely immovable, so I did it myself. It looks complicated, but it isn't really. 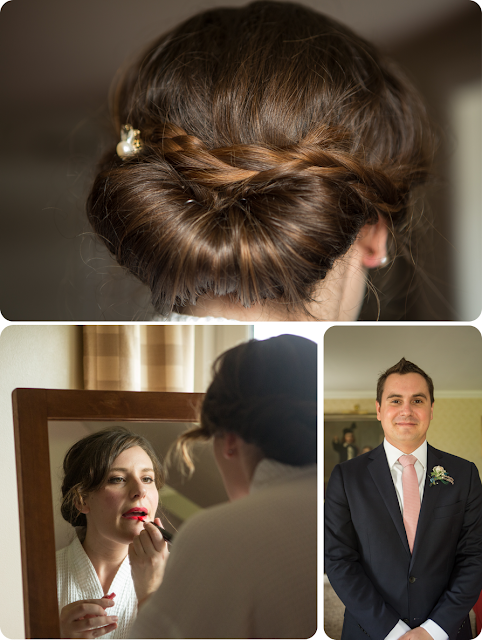 It involved a little foam french roller, two plaits, and much searching on pinterest for "DIY wedding updo". And a lot of hair. I did Rob's hair for him too, because when he does it himself he looks like a 12 year-old. He complained that it was too pointy, but I ignored him. His suit, by the way, is MJ Bale and it's very noice. When we first met with the registrar the day before at the Broadford office of the Highland Council (also the library and the police office), the plan was to have, as she put it, 'a traditional entrance', ie. she and Rob would wait on the beach, and I would walk down and make a splash. But then I was ready really early and getting anxious, and Rob hates waiting around... and so, I went downstairs and took them all by surprise. 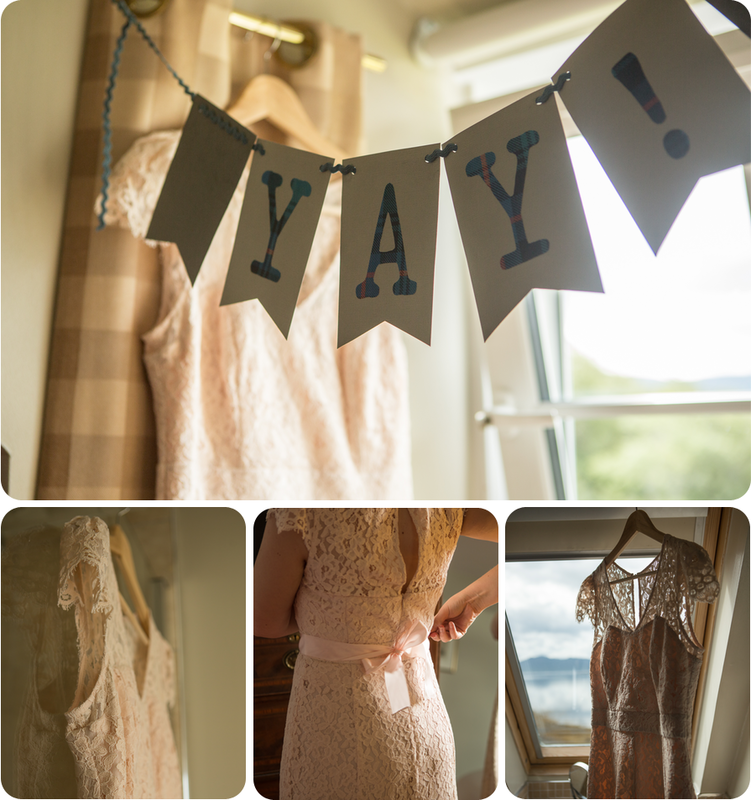 We didn't write any vows, we just went with the most basic bare bones Scottish legal wedding wording. The registrar gave it to us on an A4 piece of paper and told us to have a read before the ceremony. We left it under the seat in the car by accident, and did not have a read. I don't really remember what it said, and the registrar read out some nice words, but I don't really remember those either. I think it was very touching, though. 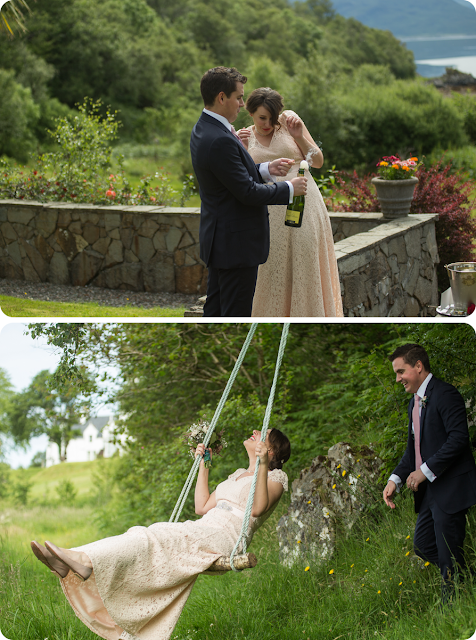 In the absence of any furniture, the register was signed on a rock, and we went back up to the lawn so that Rob could try and kill me with a champagne cork. Then we jumped in the car and followed Rosie, the photographer, out into the great outdoors. We bought the background/greenscreen on eBay, and Rob photoshopped us on to it once we got home. Hah, no, actually that's the real nature. That's how amazing it is on Skye! My little pink shoes were Tony Bianco. Were because after walking through the peat bog which was wet, abrasive and muddy, they looked very sad. At one point when I put my foot on solid-looking ground, it squelched down and brown peaty water overflowed over the edges of my shoes, and then when I attempted another step all that happened was a loud suction noise, schhlloooop. Rather than put the shoes back in my pack and kid myself that I would repair them once we got home (my usual behaviour), I put them straight in the bin. I'll admit that there were times on that walk that I thought I may have made an error in judgement (the outdoorsy component having been my idea). There being no real path, my shoes having no real grip, and my dress being reeeaal long. But I figured that if I did go face first into the mud it didn't really matter because there were already plenty of photos. As for the dress, it did get a little bit of mud around the hem, then it spent three weeks in the bottom of my pack, and another month at the bottom of the laundry basket at home. Finally I put it in the washing machine figuring that if it got destroyed that also didn't really matter, but it came out as good as new! You might have noticed that the weather was particularly fine. We were exceedingly lucky because I only had a vague contingency plan, which involved getting married in the lounge room of the hotel, and then getting quite wet. 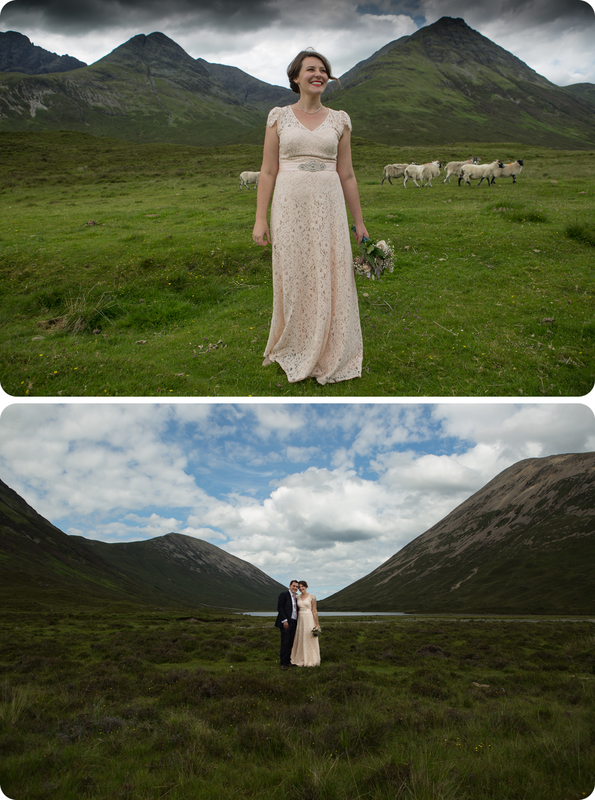 On the day we arrived in Broadford the weather was so nice that we joked with Rosie about running right back to the registry office, grabbing the registrar, and getting married right then. But as it was, we experienced two beautiful summer days before the rain set in. And I got a perfect keyhole-shaped sunburn on my upper back as a little memento of the day. The weather started to close in, and we headed back down the valley to the cars. We got back to the hotel, drank the rest of the bottle of sparkling, had a massage each, and then went to have a 5-course dinner in t-shirts and jeans. I kept my hair up though. So there you have it. 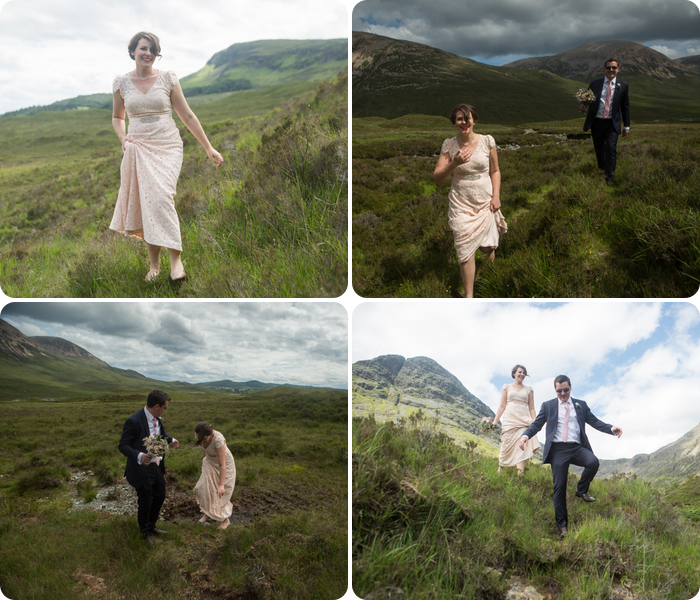 Let's run away to Scotland, said Ellie. And so we did. All photos in this post: Love Skye Photography, Broadford. 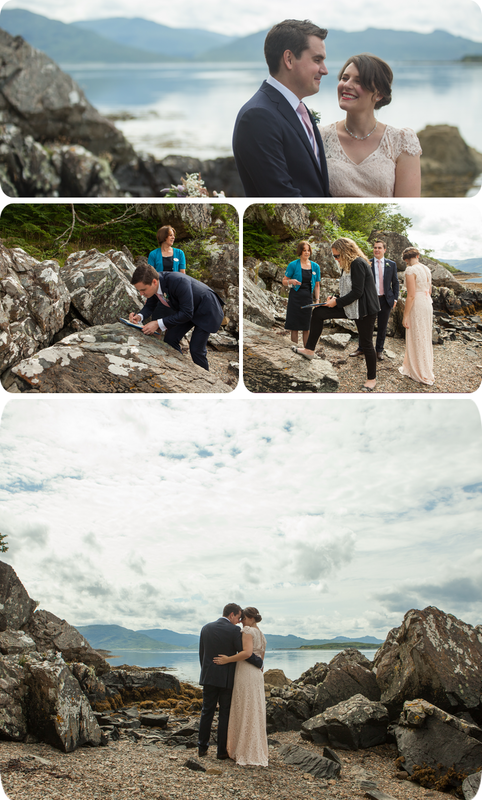 Even more photos, without any cropping/collaging (all me, so my fault if bad!) are here. The weather started to in close proximity with, in addition to most of us advancing backpedal this valley towards cars and trucks. Most of us returned towards inn, consumed all of those other bottle of wine connected with shining, received some sort of rub down just about every, then journeyed to get a 5-course an evening meal with t-shirts in addition to trousers.